Crassula are perennial succulents native to South Africa. These starter plants are easy to grow in dry, sunny conditions. The Crassula family of succulents are moderate-to-fast growers and perform best in full sun. They can be used in combination with other plants as a cascading edge piece, a standalone hanging basket, or outdoors as a groundcover. They are perennial in zones 9-12, but they are not frost-resistant. 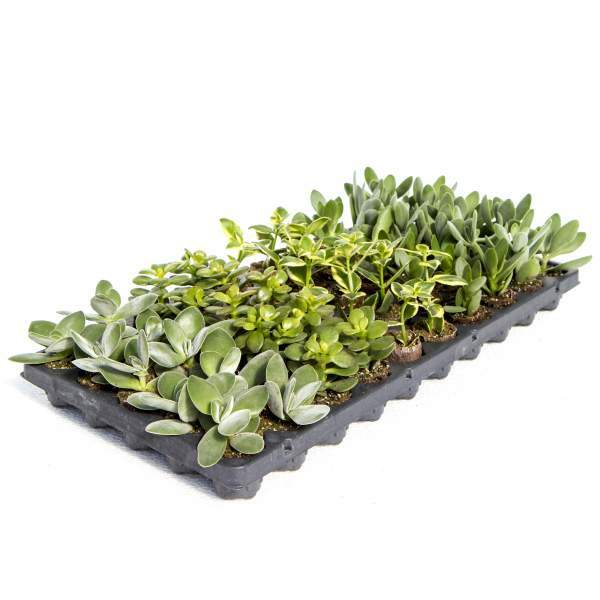 These succulents have a trailing habit, and they can grow up to 12" tall with a 24" spread. Grow succulents pots on the dry side in a very well-drained soil. They store water in their leaves and do not need to be watered as often as other plants. We recommend using a water soluble feed every two weeks at 150 ppm N. Do not allow the plant to stay saturated or you will develop root and stem rot. Maintain a pH between 5.8-6.2. To bring out the most vibrant foliage colors, grow in bright light and allow the soil to dry fully between waterings.